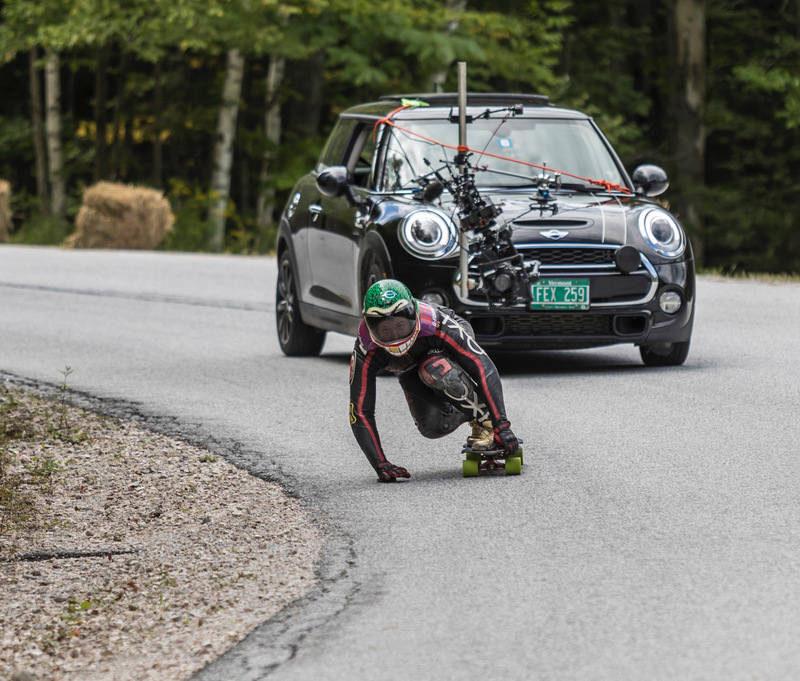 Filming a hot lap at Killington. Name, age, discipline, where you live. Congratulations on your dominance in the Women’s class and also your top 10 finish in the Open class for 2017! It’s quite impressive. Thanks, not really satisfied with the open finish, because I finished 9th, as compared to last year’s finish in 7th place. But I did advance to more semis this past year than last, so it’s a plus. How much more difficult is it to actively compete in two classes vs. just one? I’d imagine you’d end up burning through more wheels. It’s very difficult, especially when extreme conditions are present at the race, such as hot temperatures, or cold temperatures with a steady rain. It’s very taxiing on the body. I do burn through slightly more wheels, but by racing both classes I’ve gotten pretty good at using scrubbed sets for racing. Depending on my strategy and how many wheels I have access to, will race scrubs for my first round heats and sometimes even 2nd. Now that the season is over what are you doing with your you down time? Nothing fancy, basically school work. I am an online college student, and during the early parts of the season while I’m racing I’m still taking classes. Weight lifting is and staying in shape is also another one of my hobbies, so I spend a lot of time in the gym. Taking online classes and racing the international circuit can’t be easy to do at the same time. Is your performance in school as good as your performance on the race circuit? You’re right, it is not easy. Practicing good time management is way more challenging than racing. However, I do try to maintain good grades in school, so I guess you can say my in school performance is as good as my racing performance. My grade point average, is currently a 3.8 out of 4.0. 4.0 is a perfect score, so I’m pretty proud of that 3.8. Taking any measures to prepare for the 2018 race season? Yes I’m always looking to be faster in any aspect. I’ve been experimenting with equipment. Trying to see what helps. Care to share any of these experiments with us? Rather would not. It’s a competition, I can’t share all my secrets, cause then other people will start doing them. Which would negate the competitive advantage. Is there anything you are specifically going to focus on to improve your race results for this year? Yes. I’m always trying to improve everything. However, during this off season I’ve really spent a lot of time working on my physicality and technique. Who do you think will be your top competition for next year (in both Women’s and Open)? Well in my opinion, everyone is a threat, in both classes, or has the potential to be. You can never rule anyone out, and be over confident because then you setting yourself up to lose. Do you think you’ll focus your efforts on one class this year or continue to compete in multiple? I will still be competing in both classes, but I am shifting more of my focus and energy into open. Racing in the open class in very challenging for me, so I want to continue to push my limits. Advice you'd give to people who want to step up their racing skills coming into this year? A little hard work never killed anyone. Is there a specific event you are excited for this year? I’m very excited to see the return of the Gravity Festival over in New York during the length of the North American circuit. I’m planning a trip to Asia to race that circuit this year to. I’ve never been, so I’m looking forward to that as well. Asia is shaping up to be pretty awesome. I’m sure many people over there will be stoked to have you come out and compete. Good luck with your off season training and we look forward to seeing you on the hill! Thank you! Yes most definitely looking forward to meeting new people and experiencing different cultures this year!